If there is something about concepts that are worth exploring, it is because the mind is freed to enjoy total creativity without having to be bogged down by “details” such as the limitations of physics laws and the like. A concept that works can normally be found in science fiction movies and series, such as Star Wars and Star Trek, never mind that sound travels through space for us audience. The Fujitsu Lifebook 2013 is another idea that has taken on a totally different dimension, where it will function as a meeting point for many of today’s individual gizmos that we carry around with us. Most of us already own a digital camera, have a smartphone, a tablet, and a notebook – what happens when you need to travel? Packing for all of that gear alone does take up a fair bit of space and luggage weight quota, so Prashant Chandra decided to get creative and envision a future that merges all of these into a single package, using all the shared computing power simultaneously to boot. While the concept itself is future forward, it is rather disappointing to see that the name of this concept is rather ordinary, being dubbed the “Fujitsu Lifebook 2013”. Perhaps all the creativity went into conjuring up the device’s nuances, that the name is but an afterthought. 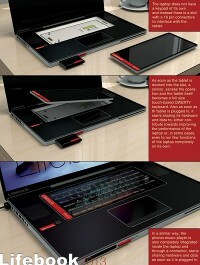 Designer Prashant Chandra’s contest submission to a competition held by Fujitsu features a laptop that has all the relevant slots for different devices, where attaching said gadget to the Lifebook would bring all it’s functions to the computer, using its own processor to get the job on the laptop done. For instance, if you fit the digital camera to the front, images can be downloaded to the computer or other devices. Want some instant tunes playback on your computer without transferring data? Easy, just slide in the smartphone/MP3 player into the corresponding slot and you are good to go. Considering how the Lifebook 2013 concept fails to include a keyboard of its own, you can always slide in a tablet, and the tablet’s surface would end up as a keyboard, while doubling up as a secondary display in the same vein as that of the Nintendo DS. Do you think something like this will ever make it to the future, or would it be too much of a hassle? its a bad idea. Just using the Laptop concept…looks like a junkyard car. they need to think outside the box. plus, it looks VERY expensive…so many devices. just do one thing, and do it well.